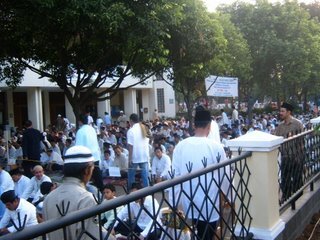 Today is the day for all moslem to celebrate the end of the fasting month. It is usually called 'Hari Raya Idul Fitri'. We started the day by going to the mosque to pray together with other people. We are lucky as there is a mosque in the neighbourhood so we don't have to go far but walking. After that, we went home and had breakfast together before we went to relatives to get together and meet the rest of the extended family. 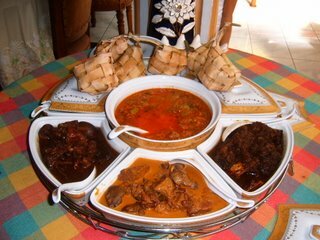 We have special food for this day, called 'Ketupat'. It is made of rice, cooked in a 'diamond shaped' coconut leaves. We usually eat it with some kind of curry, beef and or chicken. Very tasty and rich, as it uses alot of coconut milk. As you can see from the picture, children from the neighbourhood were very excited they hit the 'Bedug' (could be made out of a barrel) to make some special sound that you can hear during that day. 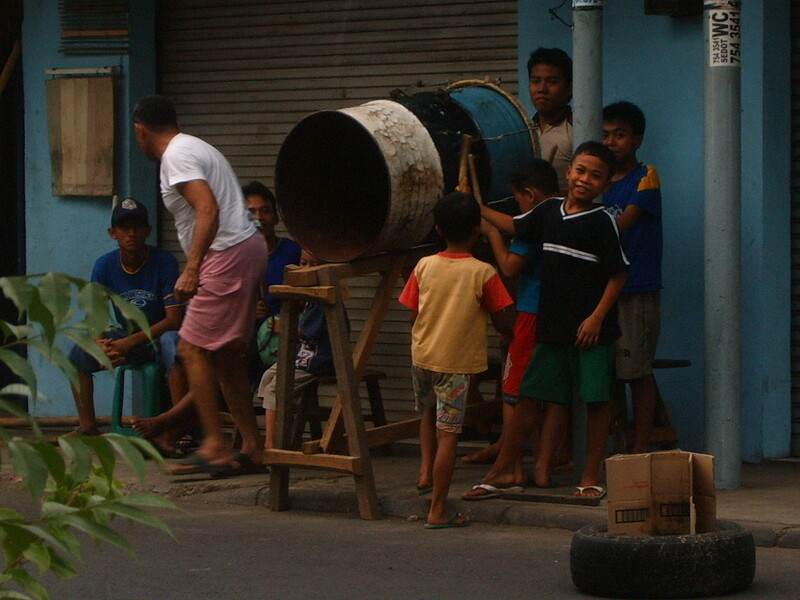 Bedug is usually used daily to call people to pray. It is a custom to try and taste the host's food whereever you go, so it is so easy to indulge yourself into some nice and tasty food, delicious cookies and nice drinks. Unlike Christmas where you usually have the big dinner or lunch at one designated place, during the 'Hari Raya Idul Fitri', we can go to few homes in one day and maybe do it again on the day after. I hope the pictures could give you all some ideas of what does it look like, by the way the picture of food was taken from my own family, so you get to see what my favourite food is like...Yummm! 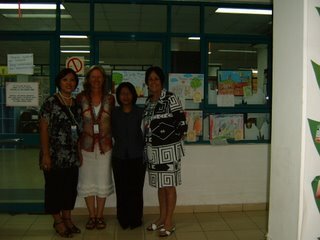 My name is Hamidah and I am the PYP coordinator at Sekolah Global Jaya. I had a great time with Jane Lukaitis, as she came with lots of ideas and openess to share with us here in jakarta, Indonesia. We are looking forward to sending our teachers to St.Leonards, to have the same experience as Jane had here at our school. 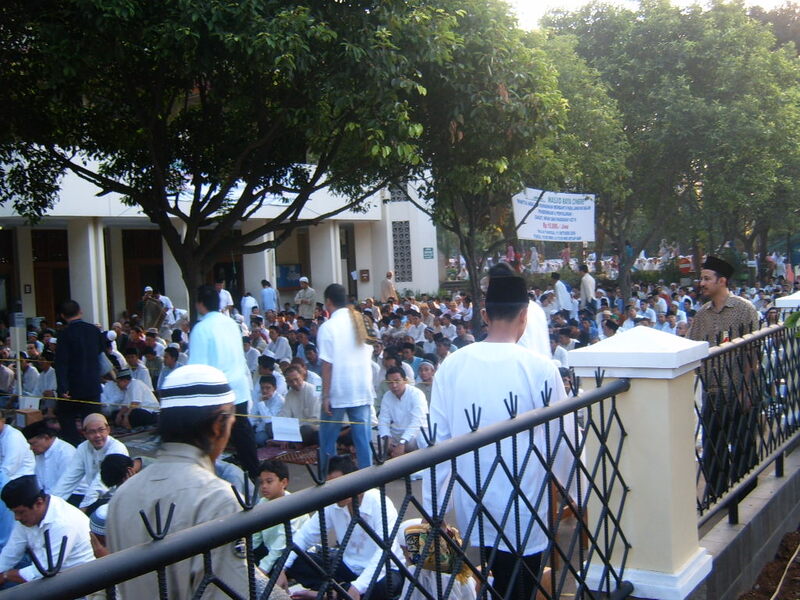 At the moment, moslem people in Indonesia are getting ready to welcome the 'Hari Raya Idul Fitri', to end the fasting month we had been having for the past 4 weeks. 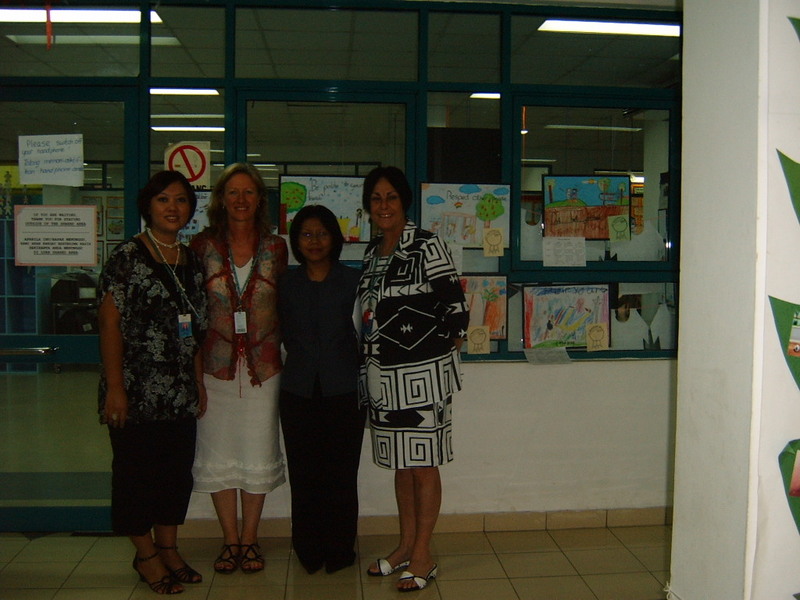 Global Jaya will start school again on November 1, 2006. Once again, thanks to Jane for all the fun we had together, for sharing her ideas, for being open minded to everything she experienced here and to all students in St.Leonards who posted some comments and I hope we can keep in touch to learn from each other and to share some of the learning experiences we have from both schools and more importantly, from both countries.